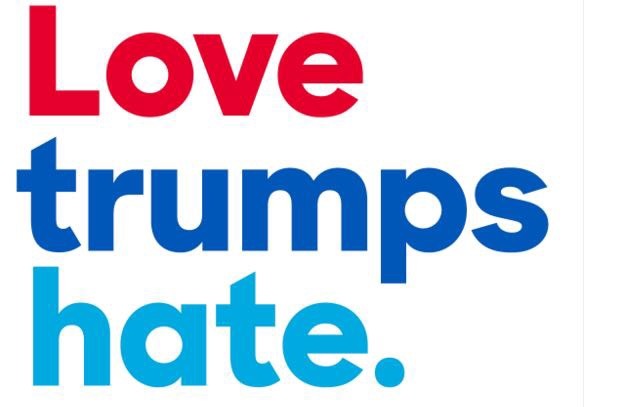 The phrase “Love Trumps Hate” was first uttered by Hillary Clinton at the Democratic National Convention, on July 28th, 2016 when she accepted the democratic nomination for President of the US. However, that phrase has now turned into something more sinister, and truthfully that phrase has become the main target when discussing liberal hypocrisies. The people saying “Love Trumps Hate” are the same people rioting in the streets, burning the American flag, and rallying against law enforcement across the country. The people using this phrase are also the same people that pulled an older gentleman out of his car, beat and robbed him. (http://www.dailywire.com/news/10664/video-trump-voter-dragged-his-car-and-beaten-gang-chase-stephens) These people did not even know the man voted for Trump, (he did) they simply assumed by the color of his skin. How can people use this phrase while simultaneously harming another human being simply for disagreeing? This “Love Trumps Hate” and Hillary supporting mother, told her child to leave their house, after she found out he had voted for Trump in a mock election held at school. The mother can be seen screaming at her child, and even telling him that she has packed his suitcase. (http://dailycaller.com/2016/11/11/worst-mother-of-the-year-kicks-kid-out-of-the-house-for-voting-for-trump-in-school-election-video/) That really does emulate “Love Trumps Hate” doesn’t it? How people still cannot see the liberal hypocrisies that are happening right now is simply unfathomable.